White Tea is made from the youngest leaves, found at the top of the plant, still covered with white or silver hair, which is the reason why this tea is reffered to as White or Silver Tea. During production, the leaves are slightly processed, going only through steaming and drying stages. White Tea is often categorized as a sub-category of green tea. Green Tea is made of dry leaves which didn’t go through the process of oxidation, hence the reason why they maintain a large amount of tannin. The colour of the leaves is green. If they are not prepared properly, the taste can be very bitter. Almost all green teas originate from China or Japan. Flavored Green Tea, aside from White Tea, is a subcategory of this group of teas. Black Tea is made of leaves that go through the complete process of oxidation.The level of oxidation of the leaves of this tea is higher than those of any other tea. This is the reason why the leaves of this category contain more caffeine(theine). The color of the leaves is always dark, mostly black or dark brown. Black Tea also has its own subgroup – Flavored Black Tea. 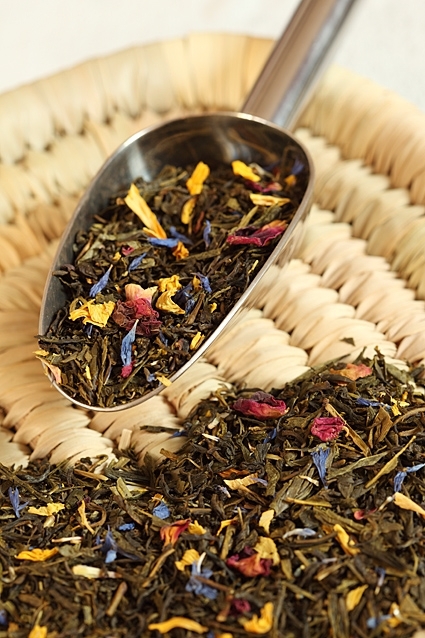 Two of the most popular teas from this group are English Breakfast Tea and Earl Grey. Oolong Tea is traditional Chinese tea of the highest quality. The plant is grown on plantations made solely for production of this type of tea. These plantations are usually located next to orchards or gardens, giving teas grown on these plantations a sweetish, fruity aroma. The leaves possess a distinctively wrinkled look and are put through a process of partial oxidation. The processing and quality of leaves obtained, allow for multifusion, and make the taste of each new cup better and fuller than the one before. Apart from the above mentioned, main categories of actual tea, other hot-water beverages are in use today, that are likely to be branded as tea. Some of them are herbal infusions(or herbal teas as some like to call them, such as chamomile, mint etc…): rooibush(South-African red bush tea), mate(South-American plant used for infusion by indigenous peoples for centuries)and many other plants, or on the other hand fruit blends(or fruit tea, such as cranberry tea, black currant tea etc…).